It’s a new year and that means new Money Back Challenge winners. We’re only a short way into 2019 and we’ve had some fantastic sales from some of our latest additions to the Travel Franchise Family. What is the Money Back Challenge? For those who aren’t familiar, the Money Back Challenge is a unique incentive we offer to all new franchisees when they join our business. This gives you the opportunity to earn your franchisee fee back, in FULL, within your first 12 months by meeting a simple sales target! 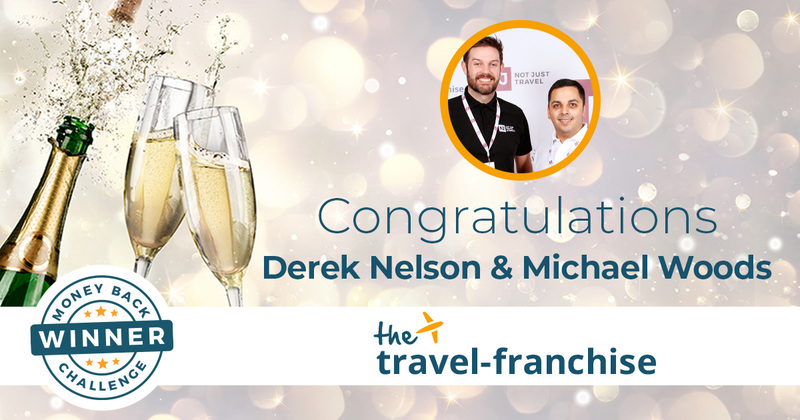 This week, we are saying a huge congratulations to Michael and Derek for completing their challenge. Not only have they smashed sales since they joined the business, they can now enjoy the added bonus of their entire franchise fee returned to them to say well done. The Money Back Challenge is achievable by everyone, and we’ve had many people make their money back in less than the 12-month deadline. We give you full training and support when you join The Travel Franchise, and with a network of over 400 award-winning and friendly Travel Consultants, you’ll never feel alone on your journey. Meet our sales team!home/news/Meet our sales team! Our in-house sales team have smashed sales in January, and they’re here to help you smash yours, too! It’s time we introduced you to our in-house sales team. They’re here to help our Travel Consultants close those sales and ultimately, make more money. Their services are available to all franchisees who feel they need a little bit of extra help closing those bookings. Whether you lack sales experience or simply work part-time and can’t fit everything in, the sales team at our headquarters are here to support you with their expert knowledge and experience. Our team did over £70,000 worth of Lapland bookings in January alone, and the Travel Consultants who use the sales team’s service will have that reflected in their commission payment. Want to know about how our sales team at HQ can benefit your business? Read on to find out more. We truly believe that if you’re looking to start a career in travel then all you need is a passion for travel and a passion for people. Many of our franchisees have never worked in the travel industry before, but we provide you with full training and ongoing support to help you build your business effectively. Our sales team have years of experience and extensive knowledge in the travel industry. Many have come from other travel agencies, airlines or tour operators, so they really know their stuff, and they can use this to help you with your business. If you’re not as confident with the sales side of things as you are with the networking, then our in-house team can be a great asset to help you turn your enquiries into bookings. Following on from our first point, if you’re great at generating leads but struggle to convert them into sales, then the head office team can help! With the team behind you, you’ll have the freedom to go out and do what you do best- network. Attend lots of events, speak to everyone you know, and then direct all the leads and enquiries directly to our sales team to seal the deal. With their years of sales experience, they’ll be able to handle your enquiries efficiently and professionally so that you start to see a higher conversion rate from your enquiries. Not only will you have more time to generate leads, but you’ll have more time to nurture your business in every area. While the sales team take care of closing the deals, you can be out networking, working on your social media presence, learning new skills, attending training events and so on. We also offer a concierge service which means we can take a lot of the admin work of your hands, so you’ll have even more time to be generating those leads.For those that run their business alongside another job, this is also a great way to take the pressure off while trying to grow your business part-time. When you use our sales team service, you still make the same amount of commission you would when dealing with the bookings on your own, but it gives you a higher chance of securing those bookings. Not only that, our sales team only discount on average around 1%. During the first few months of starting up your own home travel business, you may find yourself offering discounts to secure sales, but if you find you start relying on this, the sales team could be a good way to get you and your customers out of that habit. Retention is one of the trickiest parts of business. As a personal Travel Consultant, you need to make sure you are always engaging with your customers before, during and after their holiday if you want to see repeat custom. We know how hard this can be, especially when you feel your time should be spent finding new leads. Our in-house sales team has a repeat booking rate of 60%, so if you want to try and build up a regular client base, using the sales team could be a real benefit to your business. The power of an expert team behind you will make your business appear bigger, and their knowledge and skills will build a good rapport with your customers so that they’ll want to book with you time and time again. Are you considering starting your own business but lack the confidence when it comes to selling? The Travel Franchise offers you ongoing support and training to help you grow a successful business in travel. To find out more about benefits like this, visit our Discovery Site or give us a call on 0800 084 8128. Not Just Travel win T2 ‘Homeworking Travel Agency of the Year’ for the second year running! Overlooking the Irish Sea in the South West countryside of Ayrshire, hundreds of travel companies attended this year’s annual Travel2 awards at the resort of Trump Turnberry in Scotland awaiting some of this year’s most anticipated awards within the travel industry. Charlotte O’Brien, head of training and development at Not Just Travel, alongside David Walker and Scott Murray, two of the company’s leading franchise owners, eagerly awaited the award ceremony to discover who would come home with some of the travel industry’s most prestigious awards for UK travel agents. 2016 has been an incredible year for The Travel Franchise with franchise ownership rapidly expanding hitting all time record highs with sales to match. 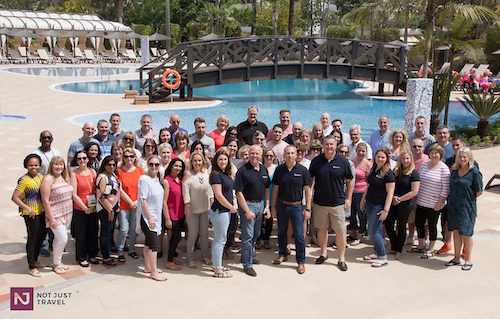 At this year’s Not Just Travel annual conference ‘Achieving Excellence’ was highlighted which is exactly what our Travel Franchise continues to achieve. Winning the award of ‘Homeworking Agency of the Year’ is the perfect recognition to round of the year and undoubtedly solidifies the dent we continue to make in the travel market place. Travel franchisees have grown, sales have grown and head office staff continue to grow along with the rapid growth of the company. It wasn’t just Not Just Travel corporate team that came home with awards either, our franchise owner David Walker also came home with the huge achievement of the ‘Winner of winner’s’ award. 2016 has been an incredible year for The Travel Franchise with the corporate team and travel consultants receiving awards for their businesses. We can only imagine what 2017 has in store! The Travel Franchisees company ethos is outstanding and so are the marks we make on the travel industry, so here’s to even bigger things for 2017. One of the biggest questions we get asked at The Travel Franchise is, how will I find customers? It’s a natural fear for everyone who joins. So, to help you see just how simple it can be, we have compiled our top 5 ways of finding customers (although when you join we give you over 100 different ideas). Each one of these 5 activities has the potential to generate all of the customers you need to be successful in this business. They are also the activities used by our top income earners within The Travel Franchise. Don’t worry if you don’t know how you would use one of these five simple marketing ideas to make money, that’s what we teach you during your training with us. Think right now about how many of your friends, family or people you know go on holiday. That’s the best place to start your business. You already know enough people to keep you busy. It doesn’t matter if they live locally or far away, there are no territories in The Travel Franchise. If you don’t know many people, business networking is a great way to build your contacts and find fantastic and loyal customers. Organisations such as BNI or 4Networking will be running events near you or your local chamber of trade. We teach lots of options and how to make this work when you attend training. Facebook is now a massive part of our lives, as is LinkedIn, Instagram and Twitter. During training, we cover a range of techniques to help you create a ‘social media strategy‘ to grow your business. This looks at the basics of how to get customers using Facebook, through to how to use social media to compliment other marketing activities. With the average price of a UK wedding now over £32,000 it’s no wonder that one in six couples now gets married overseas. You can help couples and wedding parties plan their dream overseas weddings or arrange their perfect honeymoon. You can also offer our free honeymoon gift list service which is very popular. We teach you how to use Wedding Shows to generate a very profitable customer base. Unique to The Travel Franchise, our Partners in Travel programme allows you to leverage the power of other peoples contacts or customer base to grow your business. It makes your business easier because you don’t have to go looking for customers, they come to you. We teach you how to find new Travel Partners. We manage the programme so all you have to do is help find the perfect holidays for the customers. At The Travel Franchise, we try to make it as simple as possible to start and grow your business. We teach you everything you need to know to be successful and run regular training sessions to help support and develop your business. As a partnership, we are only successful if we work together. Angela has achieved her money back in just 8 months thanks to The Travel Franchise. Not only has she made a lot of sales and commission, she also achieved our money back challenge target which means she will now get 100% of her franchise fee back. We gave Angela the lucky news while she was attending our Millionaires Retreat at this fantastic 5-star resort. It must be getting even easier to win the ‘Money Back Challenge’ at The Travel Franchise. Why? We’ve just paid out two money back challenges in one day. Our Travel Consultants have been voting for your favourite Travel Consultants to become the next Star Council members and now it’s time to reveal who has won the vote! At The Travel Franchise, we want to ensure we are always one step ahead of the game in our industry, namely, so that all of our Travel Consultants can be as successful as possible. The team at the head office work hard to support those in the field as much as possible, and with the recent introduction of the Star Council, we’ll be able to do our job even better. We wanted to give you a channel through which to feedback to our headquarters, as a way for us to improve your experience, and make our business model smoother and more efficient for everybody. What is the Star Council? As a forward-thinking business, we believe the best way to improve what we do is to hear from YOU. Each-and-every one of you is at the heart of what we do, and we want to work alongside you to support you, build yourconfidence, and listen to your ideas. Each member has been a great asset to our team at the head office and they provide an effective line of communication from the office to the field. Each position runs for one year, and then you’ll choose new representatives for the board. With the rapid growth of franchisees over the last few months, we decided it was time to expand the team. So we asked you to choose two more members for the board, and we weren’t short on nominees! Lorraine has just reached her one-year anniversary with us and has done extremely well so far. Having had her own set of challenges since becoming a Travel Consultant, Lorraine would love to be able to help other Travel Consultants have a voice, so that we can all learn from each other as we move forward. Palvi is coming up to her two-year anniversary as a Travel Consultant. During her time as a franchisee she found speaking with other consultants in the field one of the best ways to learn and grow, and now she wants to do something in return. Palvi knows that people are at the heart of what we do, and as a people person, she’s excited to become your next Star Council representative. A big well done to Lorraine and Palvi, and we look forward to working closely with you in the future! And If you ever need a friendly face to speak to then don’t be shy to get in touch with either of them for a chat. Support from our Brand Ambassador Daley Thompson! When Boxing Day hits, the world will begin to think about where they can go on their next holiday. The TV is generally littered with adverts about cruises and holiday offers, but what the general public do not know is how these deals are only a handful of what is actually available. When you become a Travel Consultant with The Travel Franchise, you will have exclusive access to the best deals, choice and availability, giving you a huge advantage when it comes to selling holidays. But in order to truly take advantage of this, you’ll need to be able to educate your customers on why they should book with you, and this is something we provide endless support and help with. This year, we have worked with our Brand Ambassador Daley Thompson to create a short video that will help our Travel Consultants explain what “Peaks” is, how it works, and how they can find the best deals for customers. As one of the world’s most successful athletes, who has himself travelled the world, he acts as a figure of credibility that potential customers can engage with. We provide training on how to speak to customers and promote your own business from the very start, but marketing materials such as this video are a great way to add value to what you say. This is just one of the many ways we work to support our franchisees with the growth of their business. To find out more about what support you could receive when you join The Travel Franchise, check out our Discovery Site! We so excited for our ski trip to Banff, Canada in March next year. This is one of our biggest trips we’ve planned to date, and it’s set to be one of the biggest and best yet, with places filling up within hours of announcing it! Banff, Canada is home to one of the best ski resorts in the world, not to mention stunning scenery and wildlife. Here, you can take in the surroundings with various outdoor activities such as hiking, glacier walking and dogsledding, or relax in the Banff Hot Springs and enjoy the Apres ski after dark. Whether you’re a seasoned skier or a novice looking to learn to snowboard, the snowfall in Canada is pretty perfect in March for all types of winter activities. If the snow isn’t for you, then hiking in the National Parks is an experience that is second to none, with the opportunity tospot wildlife such as elks and grizzly bears. And then of course there’s the Apres Ski. Banff is also home to a whole host of restaurants and bars where you can enjoy some hearty local cuisine and sip on cocktails in front of an open fire. And there’s nothing better than that after a day in the fresh mountain air. At The Travel Franchise, we know that one of the biggest attractions of becoming a Travel Consultant is the lifestyle it allows. If you’re a frequent skier, then you’ll know that trips like this don’t come cheap, but when you’re in the industry, one of the perks is having exclusive access to some of the best holiday deals. So we’ve teamed up with some of our best suppliers to arrange the trip of a lifetime for our Travel Consultants. The trip will be heavily subsidised with activities and entertainment organised by the tour operator to really make this a fantastic experience for all, even those that don’t ski! One of the biggest concerns new franchisees have when they join us is the thought of working from home getting lonely sometimes. However, at The Travel Franchise we are one big family, and host these regular trips and events to help you socialise with fellow Travel Consultants. We host a lot of overseas training trips, but this ski trip is purely for our Travel Consultants to have fun and let their hair down (with the added benefit of becoming a Banff expert in the process). These trips are designed to keep morale high and allow our Travel Consultants the opportunity to see the world for less. If you’d like he chance to be joining us on similar trips in the future, then check out our Discovery Site to find out just how easy it is to start your own travel business.